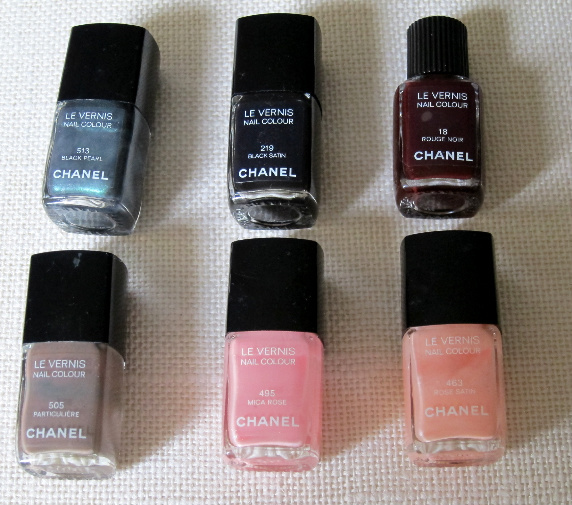 Chanel Le Vernis: my stash! I've known since I first wrote about the new Chanel nail colours that I'd be bringing at least one of them home to join my small but perfectly formed collection of Chanel polishes. I'm still deciding (I'm limited to one!) but in the meantime I thought I'd show you the six colours I've already fallen for. From top left we have Black Pearl, Black Satin and Rouge Noir; from left on the bottom row is Particuliére (my favourite so far), Mica Rose and Rose Satin. Don't they look pretty all laid out together? Like they deserve a display case, instead of being forced to share a shelf in my fridge along with the rest of my nail polish collection. Do you own these or any other Chanel polishes? And are you planning to pick up Graphite, Péridot or Quartz, to join them?! I have yet to pop my Chanel nail polish cherry! Might get Graphite or Peridot and be an absolute lemming, I think I need to get rid of some of my polishes though, I've an obscene amount! Not a one - I am deprived. @Claire what do you make of black pearl? I realised when I was taking this pic that I've hardly worn it. I don't think I love it ...have it on my toes right now though. @Sarah, I love Rouge Noir and have repurchased 3 or 4 times now over the years. There are amazing dupes out there these days though. @Karen I am actually shocked, given the size of your collection, that it doesn't include any chanel. But...'get rid of some'?!? @Sarah, you have admirable willpower! I have an ancient orangey pink colour bought in (I think) 2003 but still working perfectly, a dark navy from last year and a sandy gold colour from 2009's summer collection. I love the peridot and the mica rose from this collection but suspect the latter would need 4 coats to achieve the bottle colour. May treat myself at the weekend but only 2 one of them. You'll have to tell me which one you went for Claire!